Hello everyone! I just wanted to quickly cover a few of the many things I’ve been working on over the past month as I continue to build out the new game engine and polish the editors for v0.5. NPC behavior was implemented in-game to handle the existing settings migrated over from v0.4. This is to allow movement behavior for your characters, which defines how they will move around the scene and interact with obstacles. It’s nice seeing some life in the test dungeon! By combining a set movement area for a character and an appropriate obstacle reaction (in this case, “turn right”), you can create simple patrol routes for NPCs! In v0.5, I’d like for the engine to support characters that occupy multiple tiles, so I’ve started adding some basic functionality to allow for this. 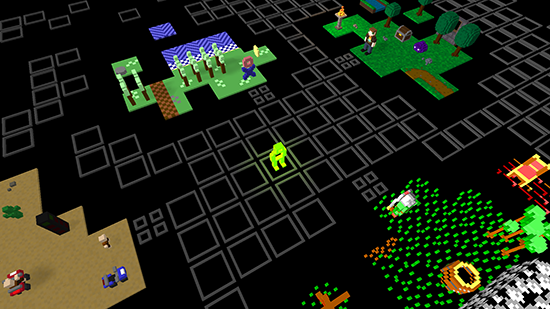 In the example below, the mother slime and its children are a 32×32 character in a map using 16×16 tiles, therefore it requires a space of 2×2 tiles when moving around. I also added a basic pause menu similar to the existing one in v0.4, with some slight tweaks to the appearance. The menu can now be navigated via keyboard or gamepad controls as well! Going forward, I’d like to make the control type options more flexible to allow for more varied types of gameplay. To help with performance in the Map Editor and in-game, I made some improvements to the mesh generation so the resulting meshes that are created when saving your models are more optimized. In regards to the Demo Game Hub for RPG in a Box, I finally took the time to update it with my desert racing minigame! As with the other demo games, you can access it from the main hub area by talking to the corresponding NPC. I’ve also made the project source files available for anyone interested in checking out the games to see how any of the logic is handled. Feel free to use any of the included resources or gameplay in your own RPG in a Box games! Thank you so much for reading and for your continued support! Don’t forget to check out the Trello board for RPG in a Box to follow my development progress in real-time!